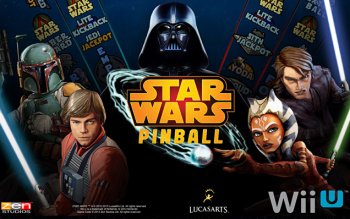 Star Wars Pinball will hit the eStore July 11th. Star Wars Pinball, the console, PC and app store title by Zen Studios, will get its Wii U debut on July 11th. When it finally hits Nintendo's eStore, it will retail for $9.99 in North America, or €9.99 in Europe. Fight for the Empire or the Alliance, changing the face of the table as you do so; how well each side is supported, world wide, will determine what the user interface looks like. The GamePad will allow display redirection from the TV to the Pad, but it also has a couple of nifty secondary display functions. Additional controls and game information, including scores and challenges, will be displayed via the Pad. The featured tables include Star Wars Episode V: The Empire Strikes Back, Boba Fett, and Star Wars: The Clone Wars. Zen promises that more tables are in development, for your Jedi-bashing pleasure. A Jedi's strength may flow from the Force, but will it also grant score multipliers and multiball? Come July, Wii U players will find out for themselves.